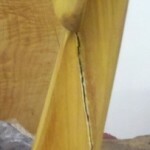 In this article we will discuss cures for wood that has warped on furniture. 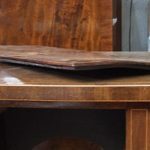 Before any attempt can be made to straighten wood that has warped, you need to understand what caused it in the first place. Most of us underestimate the power behind warped wood. Straitening is not as simple as it may sometimes seem, and every action taken will have consequence. Understanding warp is the key to reversing it permanently. 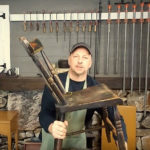 The Furniture Refinishing Studio was created to help you with your furniture restoration, refinishing and repair projects through combined video demonstrations and articles using a collaboration of skilled and approved creators. In this video, Stumpy Nubs explains why wood warps, cups and bends and how to stop it. 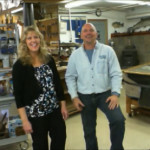 Support Stumpy by visiting their YouTube channel. The biggest problem isn't just the warping of wood itself, but our own selves that have become obsessed with instant gratification. We have become perpetually impatient people and that in and of itself just doesn't fit well with a warped table top that really doesn't care what else you have going on in your life. We gotta fix it now, right now ! Mother Nature sometimes takes control though and shows us we can’t always get the instant gratification we expect. 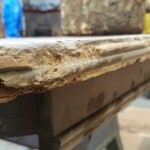 One of the most common searches we get on our website concerns warped wood. Warping can be a really frustrating problem when we're confronted with it. I will take a wild guess that if you are reading this article, you are confronted with some type of warping issue. You probably expect to find a quick easy fix because that is the world we live in. 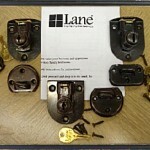 I have put this article together to include some quick fixes because they do exist.....kind of.....sometimes. Most readers have already skipped past this text looking to "get to it". 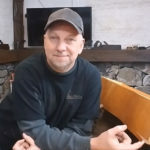 This just happens to be one of those subjects that will require you to slow down and take some time to understand a few things about wood and how & why it warps. I think before any attempt can be made to straighten wood that has warped, you really need to understand what caused it in the first place. So before we go into some different methods of non-intrusive straightening, ask yourself this question: what is wood? Silly question I know - but seriously, wood is a material made of cells and fibers that swell and shrink depending on the temperature and moisture in the surrounding air. This takes place to different extents in different directions. 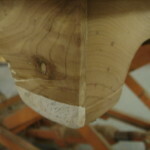 Understanding wood and it's properties is key in understanding how to fix wood warp. All solid wood expands & contracts, but to different degrees with different species. When a tree is first cut, the water in between the cells evaporates, then shrinkage sets in as some of the water within cells dries out. Drying from its green condition, wood will retain its original dimensions until the moisture content falls to about 30%, from which point it will shrink as it dries. A certain percentage of water always remains. With thorough air-seasoning, the moisture content of most types of wood will fall to between 25 and 15 percent, at which level it will be in balance with the moisture content of the air around it, and would be stable enough to be made into furniture. Longitudinal movement in normal wood is negligible. When going from green to dry, movement along the grain averages less than 0.1 percent – a 10′ piece of green wood shrinks about 1⁄8″ along its length. This movement is so small it has almost no impact on our woodworking techniques. 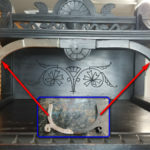 If, however, the hardwood is juvenile wood (less than 20 years from the tree’s center) the shrinkage can be upward of 2 percent or some 20 times greater. Radial movement is shrinkage that occurs as you move outward from the center of the tree. In flat-sawn lumber, radial movement affects thickness. This shrinkage is intermediate to the other two kinds of movement and is generally, in North American species, stated to be between 4 percent and 6 percent. 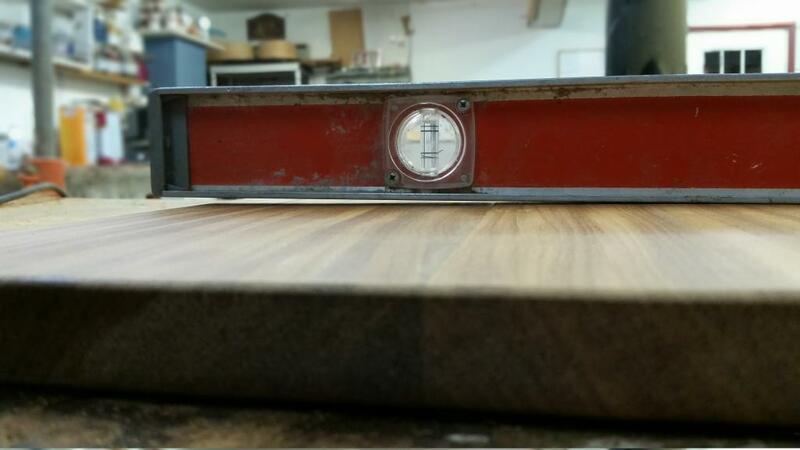 On a flat-cut, 2″-thick piece of hardwood, movement could be as much as 1⁄8″ in thickness. The third movement, and the one that is most substantial, is tangential movement. This is movement across the grain and should always be considered when building projects. Wood movement across the grain, again based on North American species, can be from a low of 6 percent to a high of around 12 percent. A flat-sawn 6″-wide board could move up to 3⁄4″ from the green to the dry stage. As you can see, tangential movement is nearly double that of radial movement. It’s important to note that each example given to this point is for flat-sawn stock. Quartersawn stock – where the width of the lumber is perpendicular to the growth rings – reacts differently. Quartersawn lumber is more stable because the faces of the boards react to radial movement instead of tangential movement. Have you ever taken notice that antique oak furniture has not suffered as much from warping as other wood species, while mahogany furniture for example seems to have more than its fair share of such problems. The principal reason for this is that much of the wood used for oak furniture was quatersawn, so that the width of the board followed the radius of the log along the medullary rays, at right angles to the annual rings. This cut produces a board which is still liable to shrink but not distort. 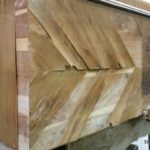 When a panel was made from quartersawn cut wood, it would be fitted in a frame without glue so that with seasonal environmental changes it could move freely. If such a panel has split, it is probably because movement has been inhibited in some way. 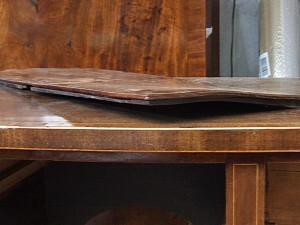 In the case of mahogany furniture, there was a demand for the widest board possible, which often meant taking a piece from the full thickness of the log. Such a board was cut through the growth rings of a tree at varying angles across the width, therefore exposing it to problems of distortion. 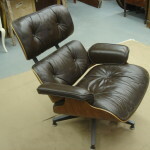 A cool environment with a relative humidity of about 55% and a little bit of air movement is said to be ideal for wood and antique objects in general. 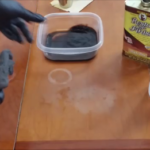 A sudden change in the circumstances is the worst thing possible as the moisture will be sucked out of or pushed into the material far too quickly causing even more tension inside it. Now that we have an idea why and how wood warps, what can we do about it? 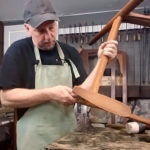 In part two of this article we will discuss cures for wood furniture that has warped and twisted.